Lindsay Lohan visited the Wendy Williams Show to talk about her transformation in life. After going through an extremely hard time publicly, Lohan moved to Dubai to avoid the chaos of the Hollywood scene. Unfortunately, she went from a chaotic celebrity life to converting to Islam. On the Wendy Williams show, Lohan commented on her upcoming role in the movie about a woman who converts to Isalm and “starts to understand the culture and how the women there are. Fencing is a big thing there, so there are a lot of fencing courses and horse-back riding… the women take her in to [help her] understand why they cover and why they do these things,” the actress told the US talk show host. Lindsay was baptized as a Catholic as a child and now claims not to be following any faith, but exploring faiths from around the world. Being that she lives in the middle east, was seen with a copy of the Quran in 2015, and now wears hijab, it seems that she has likely converted to Islam. 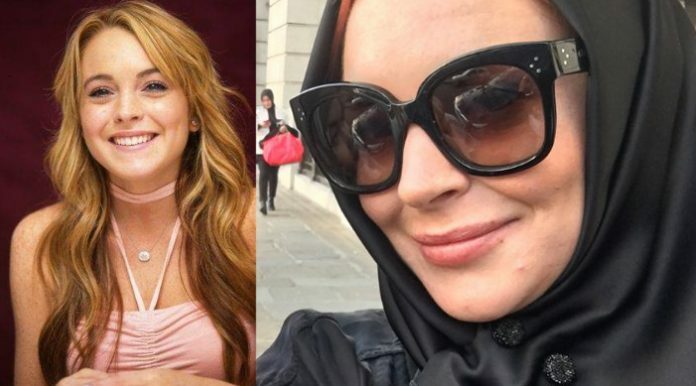 The Islamization of America is happening and it’s being influenced by celebrities like Lindsay Lohan, who was a featured child star in films watched by young people, gaining their admiration and trust. If they admire her, will they grow an appreciation for Islam as she has? A religion that condones the mistreatment of women, and child abuse? The spread of this religion in our country goes far beyond Hollywood, it has invaded our schools. For example, in the summer of 2013, the San Francisco airport built a foot-washing station for Muslims with taxpayers money. Around the same time, Harvard University posted a verse from the Qur’an at the entrance of its faculty of law, describing the verse as one of the greatest expressions of justice in history! The Constitution of the United States is founded on the right of the individual, that is the exact opposite of Islamic Law. The sickness that is spread by such a religion is slowly seeping its way into the home of the brave, causing terror attacks and invading the minds of the young. From celebrity promotion to acceptance in airports, public schools, and even prestigious universities like Harvard, Islam is spreading all throughout our nation. Signs like this should stand as a warning that if this isn’t handled carefully, the personal liberties that were fought for in the United States could slowly vanish. omgeez! really these lost souls are converting to a demonic cult???? I’m not surprised. That’s hellyweird for you.